After conclusion of comprehensive software quality audits, Evalanche is now the world’s first e-mail marketing solution to be awarded the certificate of TÜV South Product Service. The result of these week-long quality audits of security and software quality is the current TÜV certificate.The audits and software tests carried out covered the areas of functionality and data security. The testing catalogue of the TÜV for the functionality is based on the international standard ISO 25051.The testing basis for data protection was both the statutory requirements pursuant to the Federal Data Protection Act and the Telemedia Act and also the BSI recommendation with regard to standard security measures for basic IT protection. The testing basis for the data protection was the statutory requirements pursuant to the Federal Data Protection Act and Telemedia Act as well as the BSI recommendation with regard to standard security measures for basic IT protection. Confirmation of the quality by independent organisation. The TÜV certificate now confirms the quality of the software through an independent organisation.We thus generate transparency for our customers so that you can be sure you have chosen the right path with your decision in favour of Evalanche. State-of-the-art e-mail marketing for the international market. Customer-oriented core competence for software maintenance and further development directly on site in German are the guarantee for first-class service – with rapid response times. 1) According to the TÜV SOUTH certification database of 30.6.2011. 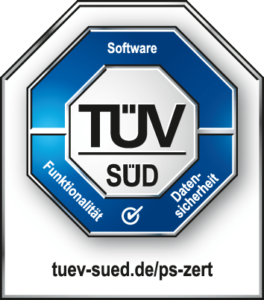 The result of these week-long quality audits of security and software quality is the current TÜV certificate. The audits and software tests carried out covered the areas of functionality and data security. The testing catalogue of the TÜV for the functionality is based on the international standard ISO 25051. The testing basis for data protection was both the statutory requirements pursuant to the Federal Data Protection Act and the Telemedia Act and also the BSI recommendation with regard to standard security measures for basic IT protection.